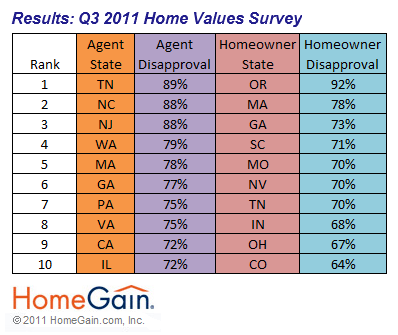 Forty-three percent of surveyed real estate professionals nationwide expect home values to stay the same over the next six months; Seventy percent disapprove of Obama's performance as President; Mitt Romney edges out Barack Obama. 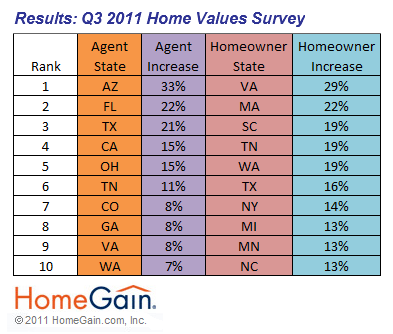 Homeowners and real estate professionals appear to be in sync regarding the direction of home prices. 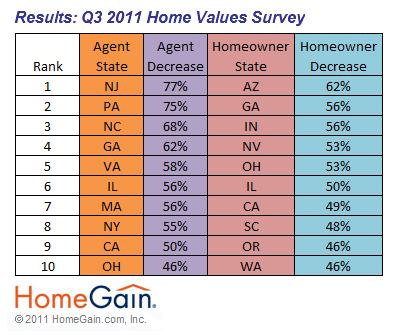 HomeGain®, the first website to provide free online instant home prices, today announced the results of its nationwide fourth quarter 2011 home values survey. 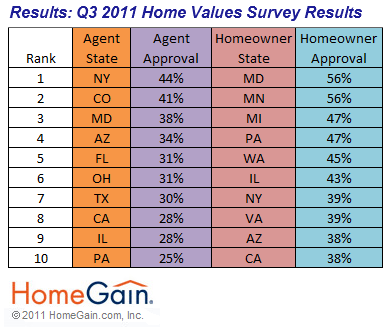 Over 400 real estate agents and brokers and over 2,000 homeowners were surveyed. Forty-four percent of homeowners “strongly disapproved” and 16 percent “somewhat disapproved” of the President’s performance, earning him a 60 percent disapproval rating. The President had a 63 percent disapproval rating last quarter among surveyed homeowners with 47 percent “strongly disapproving." The Rasmussen Daily Presidential Approval Index taken during the same period as the HomeGain Fourth Quarter 2011 Home Values Survey indicated that the President’s average disapproval rating was 52 percent with an average of 40 percent “strongly disapproving” of his performance. When asked which Presidential nominee they would vote for if the election were held today, real estate professionals favored Mitt Romney, who received 34 percent of the votes. Barack Obama received 32 percent of the votes. Homeowners were asked the same question and sided with Barack Obama, who received 41 percent of the votes. The survey was conducted from November 9 – November 20, 2011. 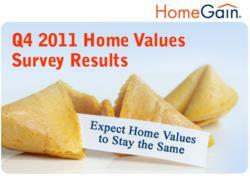 For complete survey results, including regional breakdown, visit the HomeGain Real Estate Blog.